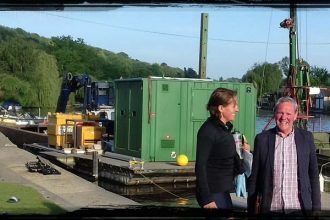 he was pleased with the improving performance of the crew through the weekend and is looking forward to building on this significant win with the Woman’s squad at Henley next year. Genevieve Bailhache- Graham took to the water on Saturday morning to contest The Bernard Churcher Trophy for Senior Single Sculls. As one of the favourites to win this event after some recent strong performances, Genevieve beat Cambridge’s Hamilton in the second round with a verdict of easily. Sunday morning saw the Henley sculler take on Stock of Poplar Blackwell where she dominated the race from the start crossing the line in a time of 6.17 and winning by 2 1/2 lengths. Genevieve lined up against Agecroft’s Salt in the final and sculled the race to perfection. She won convincingly by 2 1/2 lengths and must be filled with confidence leading in to her next challenge of The Princess Royal Challenge Sculls at Henley Royal Regatta. Lilly Stimpson, Georgia Edwards, Charlotte Orr and Issy Jonsson coxed by Ella Nolson competed for the West End ARA Trophy for J16 Coxed Fours and looked to be at the top of the draw following the time trial on Saturday morning. The first round saw Henley beat Great Marlow School by 4 lengths and in the second round, they were due to race Philips Academy of the USA. Unfortunately for the Americans an injury prevented them from racing at the last minute and Henley were granted a row over. Local adversaries Marlow RC were the other finalists in this event but Henley looked confident and strong from the start and stormed to win by 3 1/2 lengths. Georgia will have been particularly thrilled with the result as she was in Henley’s boat last year when they lifted this trophy. Henley had also entered a second J16 four of Georgie Robinson-Ranger, Charlotte Moss, Alice Jones, and Anna Roe, coxed by Gemma Sarney and whilst this crew did not qualify they will have gained much from their experience at the regatta. Ella Morgan, Lauren Kay, Clare Pearson and Florence Wiggins raced as favourites in the Nina Padwick Trophy for J16 Quad sculls after winning this boat class at National Schools Regatta. The crew were fastest qualifiers in the time trial and met Wallingford in the first round and Avon County RC in the second round. In both races, the Henley crew took the lead from the start and were able conserve energy by maintaining a healthy lead. 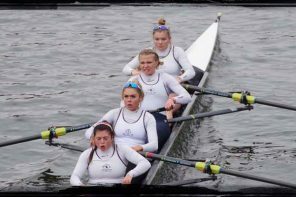 In the final they faces a strong composite crew from Nottingham and St Neots Rowing Clubs, but coming off the start the crew caught a crab, with one of the girl’s losing hold of her blade. By the time the Henley crew were ready to re-start they were left having to chase Nottingham down the course in an effort to make up five lengths distance. 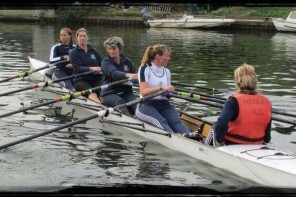 The girls valiantly made up 2 lengths but ran out of water so rowed in as very disappointed losers. A new crew combination of Alicia Redman, Katy Claridge, Kryssie Steiger, Emma Lister coxed by Esther Morgan entered the highly competitive Junior Woman’s coxed four event were pleased with the row that took them through the time trial and in to the first round of racing. After a poor start to their first round race, giving a one length lead to Kings School Chester by the end of the Island, the crew battled for the entire course with the lead being reduced to around half a length at one point, but the Chester crew were to strong and crossed the line with a 1 1/3 length lead. A crew from Reading Rowing club went on to win this event. Two Henley crews entered The Rosie Maygothling Trophy for Senior Double Sculls with only the crew of Victoria Carver and Elizabeth Williams qualifying for the first round. Unfortunately the girls came up against a very solid Nottingham RC crew and lost out to them by 4 lengths. Alice Bentley entered a composite with Katy Parker from Upper Thames but they narrowly missed out on qualification despite a strong performance. In the J17 quad event Lucas Ovsyannikov, Charlie Rollet-Manus, Alexander Meyer-O’Kane and Harry Farley, stormed away from their opposition in their heat and final to win in some style. Two of the same crew, Alexander Meyer-O’Kane and Harry Farley were earlier equally dominant in winning a straight final in J17 double. In the J15 double a new combination of Bruce Turnell and Cameron Jones triumphed despite never having raced together before and after only one training session together. In the final, they faced strong opposition from a Windsor Boys School crew who were bronze medal winners at National Schools Regatta, and a good Wallingford double. But the Henley double never let their opposition get a look in. They took off cleanly and with power to win by 2 lengths. The club’s losing finalist was Ross Taylor in J17 1x, who had won a tightly fought semi final. The girls’ squad also competed at TVP, including those no longer taking part in HWR after being knocked out on Saturday. The beaten Junior Woman’s coxed four crew of Alicia Redman, Katy Claridge, Kryssie Steiger, Emma Lister coxed by Anna Roe won the TVP event beating Lady Eleanor Holles in their heat and Maidstone Invicta in the final. Alicia, Katy, Emma and Anna also won the WJ17 coxless quad event. The WJ15 coxed four of Alice Jones, Grace Johnson, Georgia Ranger-Robinson, Charlotte moss, coxed by Bobbi Miles beat Ross rowing club and Great Marlow School in a tightly contested final of an event that had twelve entries. Grace, Georgia, Charlotte and Bobbi were joined by Tilly Lock for the WJ16 coxed four event, beating Sir William Perkins and Lady Eleanor Holles to claim their second victory. Mary Wright competed in the WJ15 singles event, beating nine other scullers to claim first prize. The WJ14 squad were also competing at TVP. In a rare outing in an octuple the crew of Felicity Parfitt, Maya Andrews, Jess Arlett, Phoebe Fletcher, Ruby Borg, Sophia Hahn, Emma Gray, Livy Petersen and Cox Esther Morgan beat Lady Eleanor Holles School by two lengths. Sophia, Maya, Phoebe, Emma and Esther went on to compete in the coxed quad event, this time losing in the final to Lady Eleanor Holles. Jess Arlett and Bobbi Miles competed in the WJ14 singles but came second in their heats. The J14 boys squad had a difficult day due injuries culminating in Felicity Parfitt substituting in one of the double sculls. She and Jack Spiers reached the final and sculled very well but could quite match opposition from Reading and Burway.